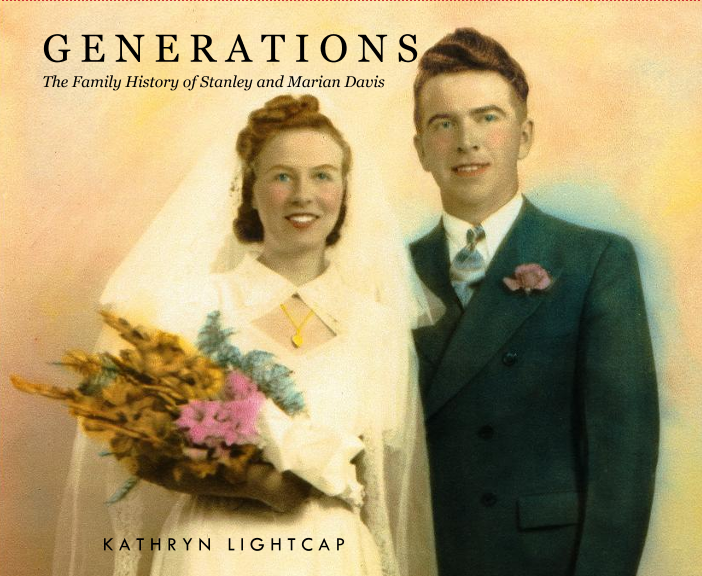 I’ve been working on a family history book on the family of my maternal grandparents, Stanley Davis and Marian Bohnsack. I write a genealogy blog, ForgottenHistory.net, which shares my research. I finally finished the book which I’m publishing the book through Blurb.com. I ordered a proof a few days ago and should receive it by September 13 . I purchased the swatch set in July and I’m glad I did. For the book, I chose ProLine Pearl photo paper, the ProLine White end sheets, and the ProLine Oatmeal hardcover linen. It cost about US$110 for the 220-page proof. Considering it’s 49¢ per page for plain color printing at Kinkos, it seems a reasonable price. Back in 2004 or 2005, I started working on a family history book that I decided to publish through Blurb.com. Genealogy is one of my favorite hobbies and I thought it would be the best way to share the information with interested family members. At the time, there was no Adobe InDesign plug-in offered, only the BookSmart software. Of course, as what happens with personal projects, it got put on the back burner because other matters took precedence. Jump ahead seven years, and I decided I HAD to finish this project. I still had the original BookSmart document and – miracle of miracles – the latest BookSmart software recognized the saved document and opened it up! Today, there is a InDesign plug-in so I had a decision to make. I debated – do I continue using the BookSmart software or start over in InDesign? I decided to stick with the BookSmart software since I was too lazy to start over. Of course, I didn’t think my targeted 50-page book would balloon to 220 pages! If I knew then what I know now, I would have made a completely different choice. Honestly, I think the software is perfectly acceptable and appropriate for the vast majority of users. Overall, a good free software. My #1 complaint is the control over fonts and text – unfortunately there is very little. Font selection is minimal and I understand why end-user fonts are not supported. But there are basic font capabilities that are missing and/or severely limited in this program. Better auto text flow. The current auto text flow is NOT good, especially if you need to change things. Better font control – that’s what this software needs. EPS is not supported. Using PNGs in place of EPS is does not provide the same result – quality suffers. Also, I can’t tell you how many times the software crashed while I was using it. It’s funny, I can run – at the same time – Photoshop CS5.5, Illustrator CS5.5, InDesign CS5.5, a couple of different browsers, and Outlook on my laptop with no problems. If I want to use BookSmart, I have to close everything otherwise the software crashes. Of course it crashes anyway, just not as often. While I will never use the software again, I think it’s appropriate for those who know little or nothing about design. Fortunately, I’m in the final proof stage. Once I get that done, I’ll submit it. I can’t wait to see the final printed piece.